What your tuition fees won’t cover - Which? Your tuition fee loan will cover everything your uni would be reasonably expected to provide in order for you to complete your degree. But what else will you need to factor in? There will be core texts for all courses which you will be expected to have. The costs can vary widely from a classic novel for an English literature course, which should be relatively cheap, through to hefty textbooks for subjects such as law or physics. You may be able to get some of the books second-hand from former students who don’t need them anymore, but remember to check the edition (second-hand copies may no longer be up to date). Lots of unis and colleges also run buy-back schemes so you can sell old books you no longer need. Books should also be available in the library to borrow, but around essay deadlines or exams, these will be in high demand; so you either need to be quick off the mark or have got hold of the books beforehand. And be kind to your fellow students: if you've finished with a book, return it right away, rather than hold on to it for longer than you need. 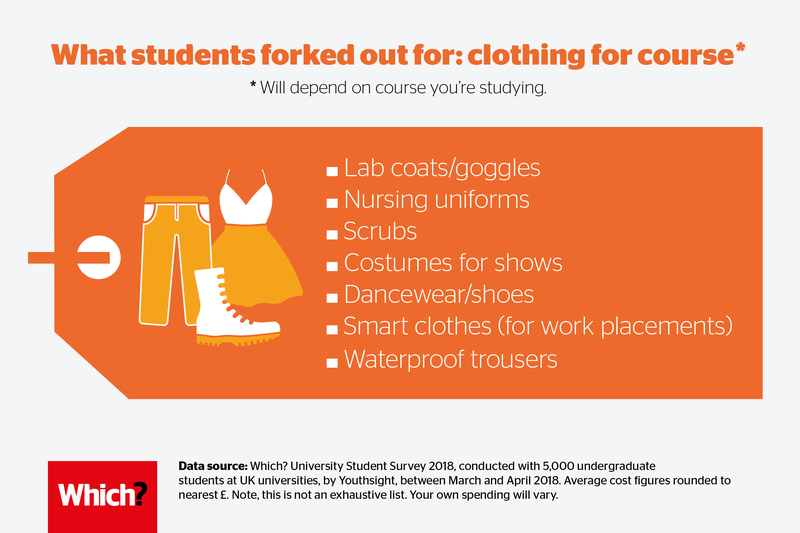 Beyond basic stationery, it’s likely there will be other things you will need to buy for your specific course, including equipment and clothing. Expenses vary from course to course – here are a few examples from students. Universities will usually provide you with some printer credit to get you started; but once this runs out you will need to pay for your own printing and photocopying. This is usually around 5p per page to print/photocopy in black and white and 25p to print/photocopy in colour – the costs do add up. Many students end up buying their own printer for convenience and to save money. You can get hold of a reasonable printer for about £50, but remember to factor in the often pricey cost of printer ink. If you (or someone you know) are a Which? member, check out our printer reviews to find the best one for you. 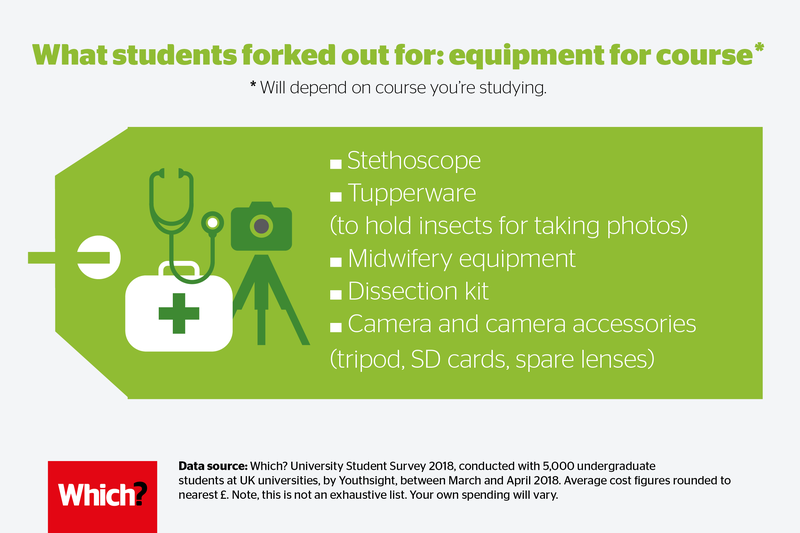 These may or may not be covered by your tuition fees, so check if you’ll need to contribute towards any compulsory trips away – these will crop up when you're in the research stage for university. Some universities and colleges will cover more than others. All universities and colleges will provide IT facilities, although having your own will make research and completing assignments much easier (as well as to watch Netflix and YouTube for hours on end). If a high-spec computer is essential for your degree (eg if you’re studying graphic design or an IT-related degree), then you may need to buy specialist kit or software. A number of courses, such as medical and teaching degrees, will involve compulsory placements where you will learn on the job. Although you may have some say in where you are placed, there is no guarantee it will be nearby and the cost of daily travel can add up quickly, even if you can get there by bus or train (especially for medical students working shifts where you might need your own transport). Remember, you’re likely to still pay tuition fees during your placement year though check this with your university. Perhaps ask at an open day if you're stuck for questions? Placements aren’t compulsory on other courses, but employers look favourably on students with some experience in their chosen field. So many students choose to do work experience or internships during holidays. Some employers pay; others will cover reasonable expenses, such as travel from within the local area and lunch. There are many other costs not included in your fees that you may be surprised at. 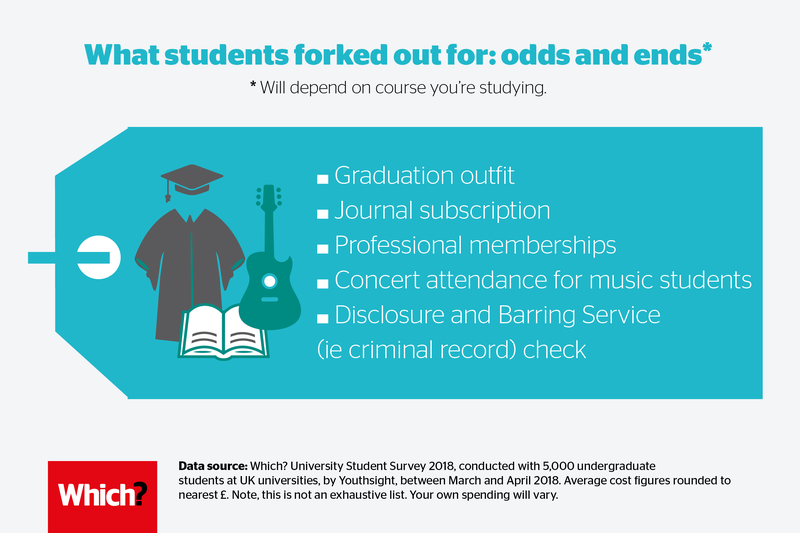 Research from the National Union of Students (NUS) shows that some university and college courses won’t include extras such as membership of specialist associations, entrance into professionally accredited exams, taking resits and CRB checks in their fees. These are your day-to-day living expenses such as accommodation, food, toiletries, clothing, travel and entertainment. See how much students said they lived on roughly (plus tips to save on these costs), then use our student budget calculator to get a tailored breakdown for your university. Help, I can’t afford all of this! Don’t worry, you won’t be expected to pay all of this out of your own pocket! While your tuition fee loan will cover your fees, the maintenance element of your student loan is designed to help you cover other costs. How much you receive will depend on your household income. You won’t need to start paying this back until once you graduate and earning over a certain amount. Learn more about how repayments work and student finance as a whole, in our finance guides for England, Northern Ireland, Scotland or Wales. You might also be eligible for a bursary or scholarship to cover some of your living costs (and in some cases, some or even all of your tuition fees). What's available, who can get it and how to apply will vary from university to university, so it's best to reach out to them directly to learn more. What's better, a fee waiver or bursary?